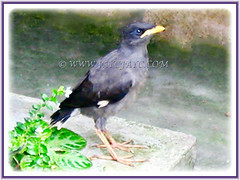 Mynas are medium-sized passerines with strong feet. Their flight is strong and direct, and they are gregarious. Their preferred habitat is fairly open country. 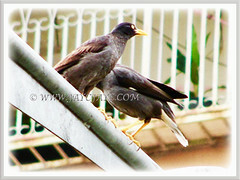 The common myna with body length of 23 cm is readily identified by the brown body, black hooded head and the bare yellow patch behind the eye. The bill and legs are bright yellow. There is a white patch on the outer primaries and the wing lining on the underside is white. The sexes are similar and birds are usually seen in pairs. It is often known as ‘Selarang’ in Singapore due to their high population there. 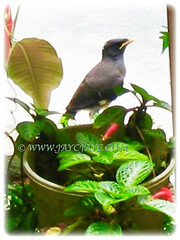 Some mynas are considered talking birds, for their ability to reproduce sounds including human speech when in captivity. An omnivorous open woodland bird with a strong territorial instinct, the myna has adapted extremely well to urban environments. Range: This is a group of passerine birds which are native to southern Asia, especially India. Habitat: This abundant passerines are typically found in open woodland, cultivation and around habitation. Also, they thrive in urban and suburban environments. They are nuisance to city buildings as their nests block gutters and drainpipes, causing water damage to building exteriors. 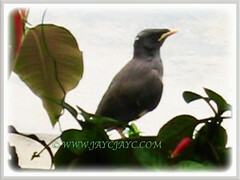 Breeding: The common myna is a hollow-nesting species. It nests and breeds in protected hollows found either naturally in trees or artificially on buildings. Compared to native hollow-nesting species, the common myna is extremely aggressive, and breeding males will actively defend areas ranging up to 0.83 hectares in size though males in densely populated urban settings tend to only defend the area immediately surrounding their nests. The common myna is also known to maintain up to two roosts simultaneously, that is, a temporary summer roost close to a breeding site and a permanent all-year roost where the female broods and incubates overnight. Both male and female common mynas will fiercely protect both roosts at all times, leading to further exclusion of native birds. Feeding and diet: The Mynas feed on insects, arachnids, crustaceans, reptiles, small mammals, grasshoppers, seeds, grain and fruits that are discarded waste from human habitation.